The new guidance is to actively offer non-choking forms of foods containing common allergens (e.g. 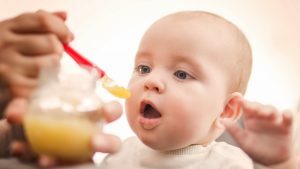 peanuts, egg) around 6 months of age, but not before 4 months, as this can be effective in preventing food allergy in some high-risk infants. This is a shift from CPS’ prior guidance which said that there was no need to delay the introduction of common allergenic foods beyond 6 months of age. These recommendations follow the Addendum Guidelines for the Prevention of Peanut Allergy, published in 2017. To learn more about these guidelines, visit our early introduction page where you’ll find an overview of the recommendations, webinars with leading allergists, and an FAQ document that addresses many common questions. As always, we recommend you consult with your physician to inquire further about early introduction of allergenic foods. CPS’ updated recommendations are a great step forward in providing consistent guidance to families around how they can potentially help prevent food allergy in their children. Having consistent guidance used by all healthcare providers is essential to ensuring patients have access to the best medical advice and potential interventions for their children, especially if it means preventing a life-threatening food allergy. However, there is still a significant amount of education and public healthcare support required to shift the mindset in adopting these recommendations in both parents and healthcare professionals. A recent U.S. survey of new or expecting caregivers of infants younger than 1 year of age found that only 31% were willing to introduce peanut before or around 6 months of age.1 Another survey to Canadian healthcare professionals found that a significant portion of family physicians recommended introduction of allergenic solids at age 1 year or more.2 These examples illustrate the need for increased education. To help reassure and guide parents through early introduction, we also require a public healthcare system that can support executing these recommendations. For instance, having a system that can identify and triage high-risk infants across all levels of healthcare, so they are given priority access to medical professionals and have the best chance possible of preventing this medical condition. We are committed in our advocacy with Health Canada and the healthcare sector to recognize that food allergy is a growing public health concern, and to make food allergy a public health priority. It’s only with greater support and resources that prevention and other interventions can be properly and effectively addressed. We will continue to keep you updated on our advocacy efforts in this area and others throughout the year.